Five hundred years ago today, Martin Luther launched the Reformation, unleashing a revolt against the late medieval order that went far beyond his intentions. On October 31, 1517, an Augustinian monk named Martin Luther probably didn’t nail his Ninety-Five Theses to a church door in Wittenberg. In early histories, Luther’s acolytes mythologized his rebellion. The theological propositions critiquing the Catholic Church’s thought and practice were to have gone straight to the people. They were printed on one-sided posters, made to be glued or nailed to church doors so that the faithful could follow the dispute. Of course, these dense and academic debates were in Latin, and few could comprehend them. In reality, Luther sent the Theses with a cover letter to his superiors in the church, lodging his concerns within official channels. This true history provides a more instructive image of the Reformation, the crisis of European society that underpinned it, and the class fissures on which it emerged. Luther’s controlled rebellion spread across Europe, sundering the Catholic Church’s power, hastening the decline of Christendom, and facilitating what he himself considered unwelcome class rebellion against the late medieval order. On the five-hundredth anniversary of the Theses, we should cut through mainstream interpretations of the Reformation and find a theological dispute hijacked by the forces of history. It is almost impossible to convey, from a modern perspective, the importance of the church and religiosity to medieval European life. Religious thought and practice influenced vast areas of social life, profoundly impacting adherents’ consciousness. Indeed, the modern state would eventually have to absorb many of the church’s functions. In the medieval period, moral, social, and what we would today call political thought all took place almost exclusively within religious institutions. Terry Eagleton has argued that no such hegemonic force could exist in modern society and that capitalist societies have struggled in vain to fill the vacuum left by religion. In 1300, most in Europe saw the Pope as their spiritual figurehead. His influence stretched from Russia in the east to the southern edge of the Spanish peninsula in the west, where only Granada remained under Muslim control. In between, isolated Jewish communities and near-dead pagan traditions hung on, subject to occasional conversion or persecution attempts. The church was vast, but it was also intimate. Baptism inaugurated Christians into the community as infants. Throughout their lives, the faithful received God’s grace — salvation from hell and a place in heaven — through the church’s sacraments: the yearly confession of sins followed by the Eucharist, when the priest transforms bread into the body of Christ. At death, Catholics received the sacrament of extreme unction. The church even intervened in the afterlife. Priests said masses and prayers for the souls of the dead. Powerful members of the laity were buried in the priests’ sanctuaries, rooms otherwise closed to the congregation. And increasingly, the church sold indulgences to the faithful, allowing them to buy their dead relatives reprieve from purgatory and speed them to heaven. The church consisted of a huge network of priests, monks, nuns, students, administrators, bishops, and other officials. The institution’s massive ideological influence, its enormous wealth and important economic functions, and its ability to legitimize earthly powers made it a hotbed of corruption and intrigue. Critics and reformers would make much of lazy and ignorant priests, the sale of indulgences, cynical fundraising, and hypocritical sermonizing. Under the Christianized Roman Empire, the church had developed into a kind of shadow bureaucracy. It more or less retained this function throughout the medieval period, holding society together across the continent. But, by the fourteenth century, the local poles of authority, diverging social elements and classes, and catastrophic crises were testing this adhesive. Economic crisis convulsed Europe in the late medieval period. By 1300, a growing rural population began to exceed the traditional feudal plots’ capacity. Food prices increased with grain shortages, and displaced peasants fled their traditional agricultural roles to cities, where they worked as wage laborers. The increase in available workers drove down pay. The climate changed, becoming cooler and wetter, contributing to famines across large swaths of Western Europe between 1315 and 1317, killing between 10 and 15 percent of the population. When the Black Death ravaged an already weakened Europe between 1347 and 1352, it killed as much as one third of the population. The psychological shock, the authorities’ powerlessness in the face of the crisis, and a lingering sense of the precarity of life itself — especially after the plague briefly returned in the 1360s — fueled religious dissent and millenarian thought. It seemed like civilization had reached its limits. Poverty and hunger flourished. These crises changed the patterns of economic and social life. Between 1375 and 1400, as many as a quarter of the villages in German-speaking territories ceased to exist, as collapsing prices for agricultural products forced rural workers into wage labor. Nature reclaimed the land farmers had cleared for cultivation in previous centuries. As the cities increased in influence, so did the power of regional princes over the Holy Roman Emperor, the titular ruler of much of Christendom. New layers of city-dwellers, with disposable incomes and a growing sense of intellectual independence from church authorities, threw their economic and social weight behind philosophical, cultural, and religious trends that helped them describe their changing world. Humanism, which called for a return to the study of antiquity and its ideas, gained influence, as did religious reform movements. This chaos and the churn of class influence helped foster widespread rebellion against the church and its rulers. The Catholic Church had faced heretical challenges throughout its history, sometimes from lone voices, sometimes from breakaway sects. Lay authorities liquidated many of these groups at the church’s behest. As Europe moved into the late medieval period, such heresies increased in sophistication and reach. For example, the Fraticelli, inspired by the new and quite mainstream interest in the book of Revelations, challenged the church’s materialism and its failure to adhere to the doctrine of poverty. Some went so far as to accuse the Pope of being the Antichrist foretold in Revelations. Meanwhile, the decline of the crusades in the Holy Land produced a different kind of conflict between peasant soldiers and religious and lay authorities. Divinely inspired by the Virgin Mary, the Shepherd’s Crusade of 1251 organized tens of thousands peasants who opposed abandoning the crusades and objected to the clerical elite’s wealth, leading to violent assaults on religious orders. A century later, at least twenty clergy members participated in the 1381 Peasants’ Revolt. The enormous uprising in southern England had several tributaries and occurred against the backdrop of the general crisis, but it also took the form of a struggle within religious institutions. Impoverished members of the lower clergy attacked wealthy abbeys, which also attracted peasants’ anger because of their harsh practices as landlords. But by far the most significant movement to challenge the church was the Hussite revolution, which in many ways laid down a marker for Luther’s Reformation. Jan Hus, a priest who campaigned against religious corruption, was executed in 1415, just over a hundred years before the Ninety-Five Theses appeared. Repeated attempts by lay authorities to destroy his movement collapsed in military defeat. The surviving Hussites divided into radicalized and more moderate factions; the radicals established mountain communes that envisioned a future classless society. These and numerous other movements shared characteristics that the Protestant Reformation would revive. Typically, radical reform movements opposed clerical wealth and corruption. They used independent readings of the gospel to establish their authority, making them fundamentalist in the true sense of the word: they eschewed traditional religious thought and practice in order to return to the essential elements of worship. They often foregrounded rebellious clergy, who broke from church hierarchy and continued to provide intellectual leadership to militants from lower social classes. Crucially, these movements tended to divide into moderate and radical wings. Starting with a demand to reform or abolish certain church practices or rituals, segments of these organizations eventually radicalized into millenarian cults that called for the destruction of the existing social order. Clerical and lay authorities usually retaliated with executions and massacres, which sometimes left behind small underground circles, too weak to preach to a wider audience. Within the context of late medieval decline and religious revolt, the question is less why Luther’s Reformation occurred than why it succeeded. How did it break through the previously impenetrable wall of repression enforced by the church, class power, and the burgeoning nation-state? The Ninety-Five Theses open with an attack on the sale of indulgences, which had grown in importance after Pope Boniface VIII issued the first Jubilee indulgence in 1300. Pope Clement VI granted the practice theological authority in 1343, in a decree that explicitly stated that the faithful could trade “a fixed amount or value of money” for Church “intercession” on behalf of dead relatives in purgatory. This commercialization, which saw church officials carry the sale of indulgences to remote towns and villages, belonged to the growing network of financial and governmental institutions that connected Rome to emergent local powers and interests. Some portion of the money raised — often from the poor and recently bereaved — went back to the Vatican while some remained with local officials. The emotive rhetoric of Dominican Johannes Tetzel’s sales pitch enraged Luther. Tetzel arrived in to the city of Magdeburg in August 1517, making outrageous claims about the power of indulgences and tormenting his audiences with tales of their dead relatives’ sufferings in purgatory. Rome had invested great importance in Tetzel’s success, as he was raising funds for the construction of St Peter’s Basilica. Another portion of his sales would go to the Archbishop Albrecht of Mainz to pay off debts to the Fugger banking family. The Fuggers, part of the emerging practice of finance and banking, drew great contempt from many — not least Luther. He had watched financial houses pile debt onto small mining ventures, including his father’s, in his childhood home of Mansfeld. By striking at this nexus of religious and financial power, Luther’s Theses outraged the church hierarchy and its loyalists. His arguments not only threatened indulgences; they also questioned the Church’s authority and capacity to dispense grace to the faithful. Luther himself seems not to have believed that the posting of the Theses launched the Reformation. Rather, he considered the four years that followed as more important. From 1517 to 1521, his critique of the church developed through a series of confrontations and expositions. Opposition to indulgences and corruption would eventually take a secondary place in Luther’s thought, but this initial rebellion indicated his critique’s final form. At the heart of Luther’s thought sat a dissenting view of grace. He contended that faith — not works — influenced God’s decision to impart grace, a claim that undermined the whole edifice of the church. Luther’s ideas eventually became synonymous with the notion of sola scriptura — the idea that the Bible was the most important source for Christian thought. This belief underpinned his rejection of many Catholic traditions that had developed over hundreds of years. He sent the Theses first to his superior, Albrecht of Mainz, who then passed them on to Rome. By early 1518, some members of the Roman hierarchy were already calling for Luther to be silenced. Meanwhile, his work had begun circulating in the major centers of German humanist thought, such as Nuremberg. Within months, readers across Europe would encounter his writing with mixed — but growing — enthusiasm. Most historians don’t credit Luther with printing the Theses in German, but he did publish his “Sermon on Indulgences and Grace” in the vernacular and made sure it spread among intellectual town-dwellers who had the wealth and social position to enjoy a degree of independence from the church and aristocracy. When the church accused Luther of heresy in August 1518 and summoned him to Rome, Frederick III, the Elector of Saxony, interceded to keep him in German lands, where he continued to debate critics and face examination by Papal officials. By the time Luther met a church loyalist for a disputation in the summer of 1519 in Leipzig, the Augustinian Order had released him, and he was openly denouncing the Pope’s authority. Meanwhile, his renown was growing among both adherents and opponents. His texts — and those that attacked him — were equally likely to be burnt in public. 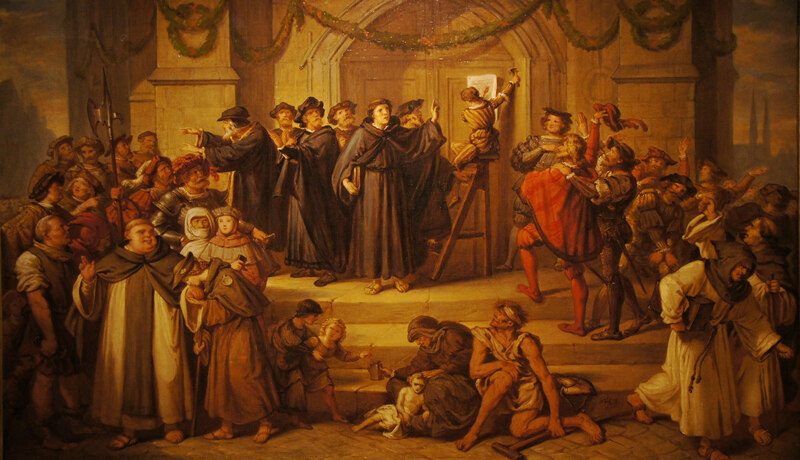 The showdown finally occurred in 1521, at the Diet of Worms. The assembly represented an attempt to reorganize relations between the emperor and the princes. Most participants expected that it would result in greater autonomy for the latter, signaling the Holy Roman Empire’s weakening force. Rome continued to demand that Luther appear, and Frederick III continued to object. Rather than go to the Vatican, Luther met his accusers in German lands, this time before an audience of both lay and religious authorities. The stakes were high on both sides: the church feared Luther’s ability to expound his new vision in front of the German aristocracy, and Luther feared he would face the same fate as Jan Hus, who was invited to the Council of Constance with promises of safe conduct and then burned at the stake. Indeed, at the Leipzig debate, Luther had already accepted his theological similarities with Hus — a move that scandalized Catholic loyalists. Asked to recant his writings at Worms, Luther refused. The death he now thought likely was averted when Frederick’s men abducted him. He spent almost a year at Wartburg Castle, where he formalized his views, produced many of his most enduring texts, and translated the New Testament into German. As Luther languished, the furies of religious dissent arrived in his Wittenberg stronghold. Acolytes such as Andreas Karlstadt went far beyond Luther’s original ideas, calling for the destruction of religious statues and images. Karlstadt abandoned religious garb and started dressing as a poor peasant. He performed services in German and got married, inciting the church’s anger. When Luther finally emerged from Wartburg, he became a force for restraint within the increasingly diverse Reformation movement. He called for a stop to many of the more aggressive changes and introduced a more gradual pace of change. But the Reformation had already proved capable of bursting any boundaries. Once church authority and official doctrine fell, few parameters limited where Reformation thought could go. Sola scriptura offered little restraint because readers could almost endlessly interpret and reinterpret the Bible. In Wittenberg, Luther warned against the dangers of “insurrection and rebellion.” He understood that theological reform could transform into revolt against all authority — a reasonable conclusion considering the complete integration of religion into medieval social life. The Zwickau Prophets, who appeared in Wittenberg in late 1521, only reinforced Luther’s determination to stamp out the new radicalism. The group preached the equality of men and the apocalyptic return of Christ, ideas that Luther himself rejected. The Reformation’s radical potential reached its zenith when it combined with the demands of lower and middle classes, who were struggling to survive in the disorder of the late medieval economy. Between 1524 and 1525, hundreds of thousands of peasants, medium and small farmers, and the other poor and middling layers in the towns rose up against the feudal order. Their program, thought to be inspired or even authored by radical preachers — including one-time Zwickau associate Thomas Muntzer — called for an end to many of the elite’s extractive practices, including serfdom, the bedrock of the rural economy that tied peasants to the aristocracy and offered them few rights. The movement’s intense radicalism and violence horrified the German princes and briefly united Catholic and Protestant interests. Luther first called for reconciliation and compromise then firmly supported the ruling order. In 1525, he wrote his infamous pamphlet “Against the Murdering, Thieving Hordes of the Peasants.” Its circulation coincided with a vicious crackdown carried out by the princes’ armies, which are thought to have killed approximately one hundred thousand revolutionaries. Religious dissent movements had long attracted diverse class elements, particularly members of the middle and lower classes, but this composition left them vulnerable to repression from above. Indeed, Luther’s success depended on the support he garnered from some of the elite layers of society, especially the princes. Yet Luther’s defense of the uprising’s suppression represented the limits of a movement dependent on their protection. Frederick III kept Luther alive, and princes who wanted greater autonomy in their lands and access to church-held property adopted his more moderate positions. The movement gained so much momentum that many rulers felt obliged to join it in order to shape its outcome, which they did by containing its radical outgrowths. As much as elites helped protect the Reformation from the Catholic Church and the Holy Roman Empire, they also limited its radicalism, popularity, and growth. Catholic rulers remained in control of southern Germany as well as most of southern and western Europe. Protestant minorities faced persecution across the continent — most notably the Huguenots in France. The Reformation’s message — or versions of it — gained more traction where local rulers had the most to gain by independence. In a divided and war-ravaged Europe, Luther’s own ambitions for religious reform narrowed. His movement continued to splinter into innumerable factions, sometimes due to local differences but just as often along lines of class or radicalism. It has become cliché to understand the Reformation as evidence of Western ingenuity — the birth pains of the democratic, freethinking, and pluralistic society. Another view claims that the Reformation played an essential role in the development of capitalism across Europe, a view frequently misattributed to Max Weber’s The Protestant Ethic and the Spirit of Capitalism. Histories recapitulating these ideas are returning to bookstores to celebrate the fifth centenary of Luther’s Theses. But real historical development followed a far more complex, contradictory, and bloody path. Characterizing Protestantism as the seed of the Enlightenment or of the classical liberal tradition ignores its often dogmatic forms and its relative disinterest in intellectual life outside theology. Indeed, in the Reformation period itself, many Catholic humanist intellectuals, such as Desiderius Erasmus, rejected the movement for its sheer inflexibility. Nevertheless, we can find islands of truth in these simplified, ideological stories. The Reformation did help foster radical and dissenting traditions, some of which were expunged in Luther’s own day. But strains of the Reformation lived on to help shape bourgeois revolutionary movements in the Low Countries in 1566 and in the English Revolution in 1640. Some of the states still within the Catholic Church’s sphere of influence contained substantial and restive Protestant minorities. These movements, often influenced by the ideas of John Calvin, helped introduce ideas that would become central to future radical movements. Unable to form breakaway nations based on the power of local rulers, some Calvinists instead advocated the overthrow of the state. By advancing the breakdown of the late medieval order, damaging the church’s ideological control, and, in some instances, arguing against the permanence of class or state power, the Reformation helped foster radical impulses in Europe. That is Luther’s gift to us, even though it is one he would never have offered. David Jamieson is a journalist and socialist activist based in Scotland.